Experience the sakura season in all its splendour at these off-the-beaten-path locations. Sakura season is right around the corner and while Tokyo can be convenient (and extremely popular!) 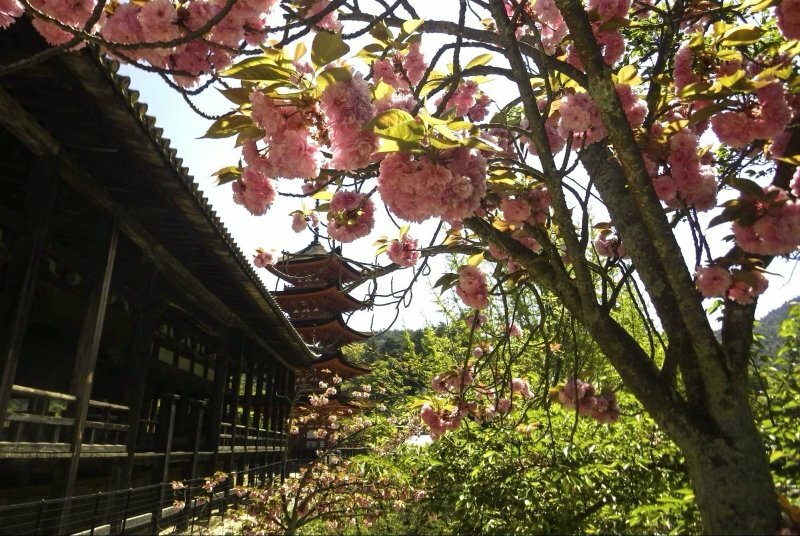 to view the iconic sakura in full bloom, why not visit an exciting new destination for a change? Think about it: Tokyo is a big sakura hotspot and the city will be packed with throngs of locals and tourists alike jostling to catch a glimpse of the coveted blooms. However, visit alternative sakura locations like Kitakyushu, Himeji or Hiroshima, and we guarantee a blissful, tranquil and all-around more enjoyable experience. First up, head over to Kitakyushu in Fukuoka prefecture. 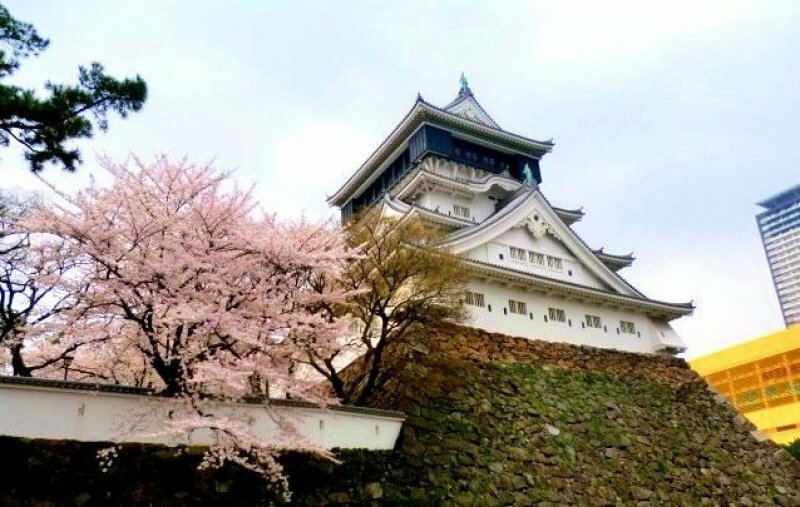 The city is full of stunning sakura spots: join the locals in having a picnic under the pink canopies at Katsuyama Park or have a panoramic aerial view from the top of Kokura Castle located within the park grounds. Shiranoe Botanical Garden is also another top spot, especially with it being located high on a hill overlooking the Sea of Suo. Wander amongst vibrant seasonal flowers or have a cup of coffee at the Ohana Chaya teahouse to end off your visit to the botanical gardens! Drop by Mekari Park as well, popular for both bird-watchers and sakura-chasers alike. This large park stretches from the peak of Mount Kojo all the way to the coastline, giving rise to tons of space for sakura picnics. Don’t forget to take in the impressive view of the Kanmon Straits from the park’s observation deck whilst you’re there! Kitakyushu is located just 15 minutes away from Fukuoka’s main Hakata station, making for a perfect day trip destination! Fukuoka is a bustling hub of activity and is the gateway to many other off-the-beaten-path sakura destinations, such as Yanagawa, Nagasaki and Okayama. If you’re planning to explore the region, do make sure to book an accommodation near Hakata Station! We’ve got just the thing for you – located just 10-minutes away from the station by foot, this spacious two-bedroom apartment can accommodate up to five guests. Besides being situated in a quiet residential area, the apartment is also well-fitted with a fully-equipped kitchen, washing machine and even Wi-Fi! For even more cost savings, take advantage of the kitchen to prepare your picnic goodies before heading out for a sakura picnic. BOOK THIS VACATION RENTAL NOW fr. SGD31/PAX PER NIGHT! Hyogo prefecture is home to many sakura spots, with Himeji being the most renowned. 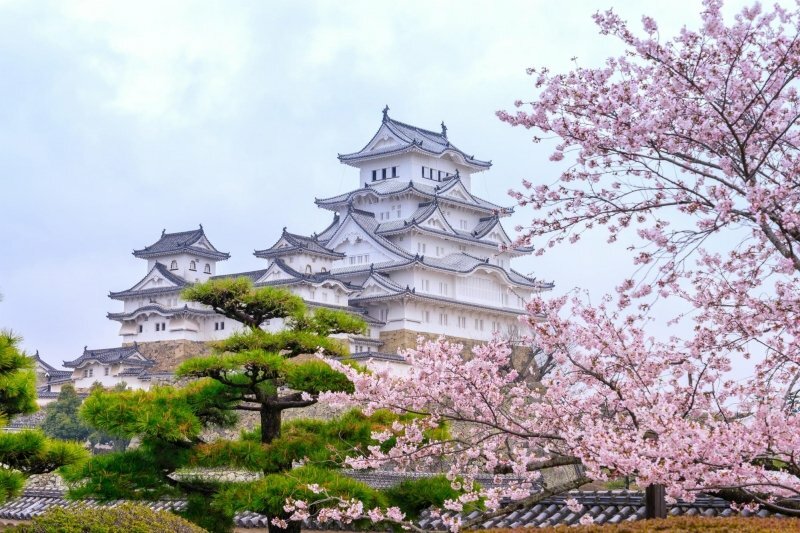 Uncover the beauty of the city’s most popular attraction, Himeji Castle. Nicknamed ‘The White Heron’, this imposing yet spectacular structure is both a national and an international heritage site. The castle grounds contain around 1000 cherry trees. Just imagine that! Also take the chance to explore the adjacent Koko-en Garden, a lavish garden which was inaugurated at Himeji’s 100th anniversary. Its 9 separate gardens showcase a variety of flora and fauna, including sweeping sakura landscapes, which adorn the garden with its beauty. For a unique experience, check out Tegarayama Central Park, a spacious garden with a multitude of attractions including a European-style castle, an aquarium, an amusement park and of course, plenty of cherry trees! When in Hyogo, spread out in this spacious apartment! Located in Kobe, the apartment is a short ten-minute walk to Harborland Station, where you can get to Himeji in just 40 minutes. Comprising three bedrooms, the apartment is able to accommodate up to a total of ten people – which is perfect for a big family or your squad of friends. In addition, it’s furnished with two bathrooms (which is rare for Japanese accommodations! ), a living area and a kitchen. Rental of the apartment also comes with use of a pocket Wi-Fi device, allowing every member of your travel party to stay connected on the go. Upload your sakura pictures as and when you want and make all your followers terribly jealous! BOOK THIS VACATION RENTAL NOW fr. SGD87/PAX PER NIGHT! Miyajima Island of Hiroshima Prefecture is considered to be one of Japan’s most beautiful spots! The majestic Itsukushima Shrine is the star of the island, and is home to the famous ‘floating’ tori gate; so named due to the gate seeming as if it’s floating during high tide. However, adding to the grandeur of this cultural site are the pink sakura blossoms that surround the shrine. The small island holds another hidden gem in the form of Omoto Park. Apart from housing several large cherry trees, this park is also home to a herd of local deer. Plus, these deer actually roam freely around the island, so do grab the chance to get up close and personal with these gentle creatures! There is no accommodation available on Miyajima Island; it is, however, an easy day trip from Hiroshima (via train and ferry). Splash out in luxury at this impressive two-story house in Hiroshima, which can easily accommodate a family of ten in two bedrooms. Equipped with basic necessities such as a refrigerator, microwave, washing machine with dryer and a large living room with free Wi-Fi, you will definitely feel right at home. Besides, just look at the aesthetics of the interior – it looks like it came straight out of a Muji catalogue! Have the space to conduct a photo shoot within the premises itself, which makes for a fun activity for you and your friends. BOOK THIS VACATION RENTAL NOW fr. SGD92/PAX PER NIGHT! Best known for its quirky Cup Noodles Museum, Yokohama is also one of the country’s outstanding sakura spots! A top pick would be Sankeien Garden, a vast traditional Japanese garden containing a small waterfall, bridges and a pond, all of which stand sentinel against a sweeping background of pink petals. 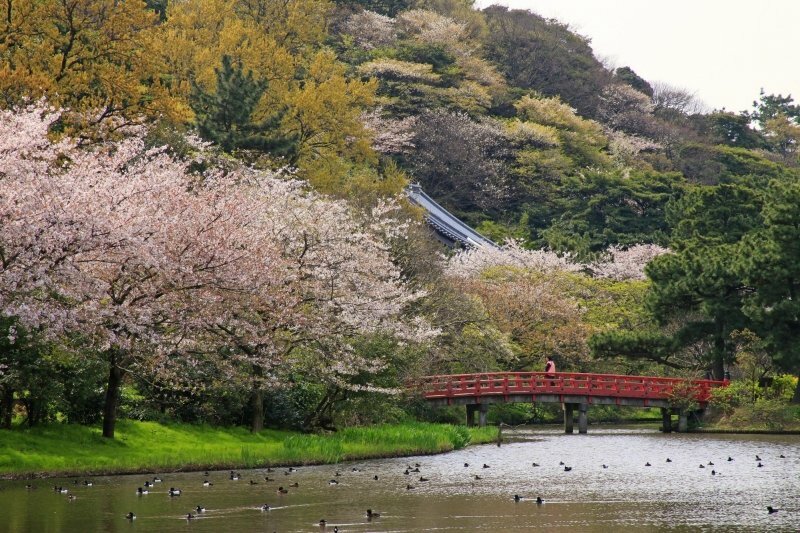 Negishi Forest Park is also another tranquil sakura spot, which offers many varieties of cherry and plum blossoms. Previously a horse racetrack, Negishi Forest Park stretches across a wide area and sees little to no tourists, a.k.a. the epitome of crowd-free sakura-viewing! In addition, don’t miss out on the splendour of Shomyoji Temple, which blushes pink with an array of cherry blossoms every spring. Check out this welcoming three-bedroom apartment in Yokohama, which can house eight guests across three bedrooms. There’s even a hot tub and waterbed too! The apartment is located only a stone’s throw away from Isezaki-chōjamachi Station and Kannai Station, which are easily accessible to the city’s sakura spots. This apartment also boasts proximity to the nearby Isezaki Mall, which is perfect if you wish to take a day off from sakura hunting. Moreover, there’s a sakura tree located right outside the apartment, so you really don’t have to go far at all! BOOK THIS VACATION RENTAL NOW fr. SGD49/PAX PER NIGHT! Kobe is a city particularly known for its world-class marbled Wagyu beef, aptly named ‘Kobe beef’. However, apart from its gastronomic scene, Kobe is also home to multiple sakura spots that are a sheer feast for the eyes. Make a beeline for Oji Zoo, which is surprisingly one of the city’s best sakura spots! Just imagine wandering amidst animal enclosures with pink blooms overhead. 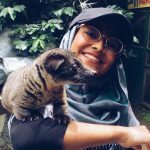 It’ll definitely be a one-of-a-kind zoo experience! In addition, drop by Egeyama Park for a captivating view of Kobe’s skyline. 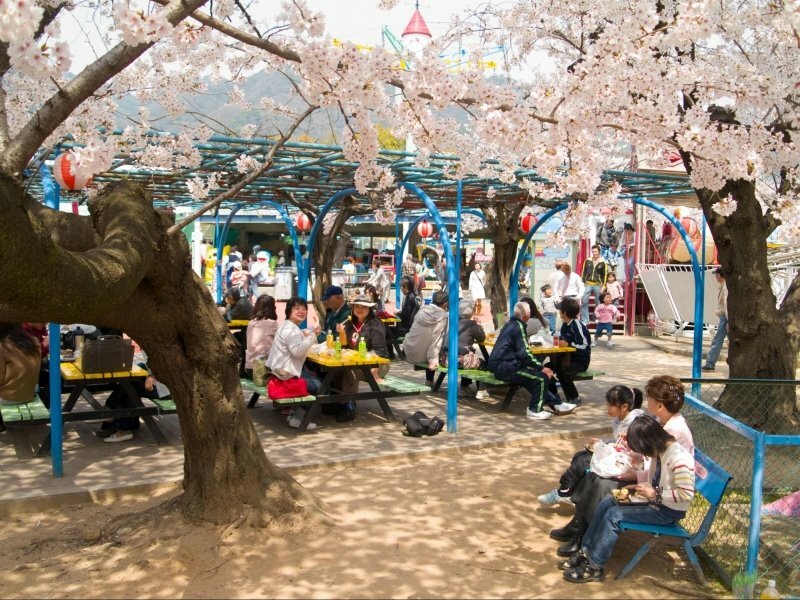 The park is also a great place for a sakura picnic! If you’re looking for an accommodation that can fit a large group, then this four bedroom apartment has got you covered! With the ability to accommodate thirteen guests with its four single beds and four Japanese futons, guests of this apartment are able to choose to sleep in beds or on futons the traditional Japanese way. To top it all off, this spacious space also located close to many major landmarks such as Harborland, Port Island and Chinatown. Besides, the apartment is located close to the JR Kobe station, which is perfect should you be planning to embark on day trips. BOOK THIS VACATION RENTAL NOW fr. SGD108/PAX PER NIGHT! So why only stick to Tokyo when there are so many stunning sakura spots to discover sans the crowds? Be different and bookmark these undiscovered sakura spots for your upcoming trip! Sometimes, staying in hotels or hostels isn’t the most ideal for when you’re travelling with families or large groups of friends. After all, where’s the fun in splitting up at the end of the day? The fun never has to stop when you book a HomeAway vacation rental that can accommodate everyone together in one space! Besides being able to stay together, HomeAway vacation rentals often come with a shared living area and kitchen. Laugh and marvel at the day’s sakura photographs as all of you lounge in the shared living area. Similarly, you can use the kitchen to prepare your picnic food or to fix up a late-night supper. If you rather travel light, most vacation rentals also come with a washing machine (and sometimes even a dryer! ), allowing you to wash your clothes on the go. However, don’t just take our word for it, read the multiple user reviews to find out how great particular vacation rental really is! Excited about your upcoming sakura adventure? Book your stay with HomeAway now and you’ll be all set!